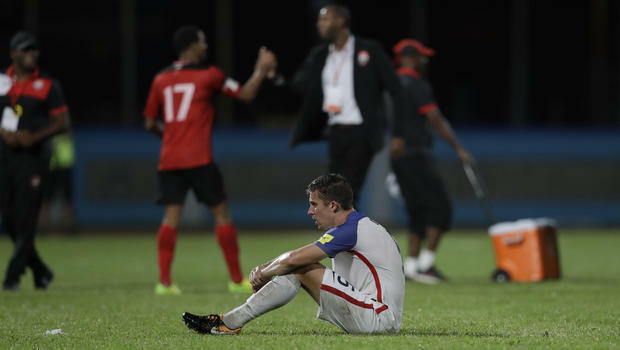 For the first time in 31 years, the United States Men’s National Soccer Team failed to qualify for the World Cup after its poor performance in the Confederation of North, Central, American and Caribbean Association of Football (CONCACAF) qualifying hexagonal. To the disappointment of many U.S. fans, Tim Howard, Michael Bradley, Clint Dempsey, Omar Gonzalez, and Christian Pulisic, all big names in the world of soccer, will not be making an appearance in Russia next summer. The team’s failure was solidified on the night of Oct. 10, in a near-empty Caribbean arena just slightly larger than Swarthmore’s attempt at a stadium. After conceding two goals in the first half, one of which was an accidental own goal, the U.S. simply made too many other mistakes to fully recover. The game concluded with a soulless 2-1 defeat to the already-eliminated Trinidad & Tobago, loser of eight of its previous nine games. U.S. defender Omar Gonzalez, who scored the own goal, responded to the loss with frustration and sadness. “We let down an entire nation today,” he said. Coach Bruce Arena also commented on the outcome of the match. Not all shared the disappointment of the U.S., though. Former CONCACAF president and Trinidad-born Jack Warner called his country’s defeat of the U.S. the happiest day of [his] life, adding that nobody in CONCACAF likes the U.S. Warner, a former FIFA vice-president, already has some poor history with the U.S., due to his alleged involvement in corruption in the sport and consequently being a main target of the U.S. Department of Justice. However, surprisingly enough, the loss to Trinidad did not by itself guarantee the United States’ failure to qualify. Instead, it was a combination of unfavorable events that resulted in the unfortunate outcome. The CONCACAF hexagonal is the fifth and final round of the World Cup qualifying process that began back in January 2015. It is a six-team round robin tournament from which the top three teams qualify for the World Cup, while the fourth place team plays an intercontinental playoff for a spot. Going into the final matches, the U.S. was in third place, and all they needed to guarantee qualification was a draw against Trinidad. Panama and Honduras were the other teams in the mix. When the U.S. lost the match, the team was even more devastated to find out that both Panama and Honduras had won their matches, pushing the U.S. to fifth place and elimination. “Everything that could have possibly gone wrong did, in this stadium and in two other stadiums across the region,” commented team captain Michael Bradley. Gonzalez also spoke after the elimination about the loss and his own goal. “It’s one that will haunt me forever. It’s the worst day of my career … What was supposed to be a celebration is now … I don’t even know what to say. It’s terrible,” said Gonzalez. “If you don’t look at yourself after this individually,” he said, “I think you’re f—ed up in the head,” said disconsolate forward Jozy Altidore. Rightfully so, Coach Arena took responsibility for the outcome of the hexagonal. Missing the World Cup will likely put the United States Soccer Federation (USSF) on a tighter budget in years to come. The revenue lost from not going to Russia next year will affect salaries for staff members who might already be on the fence about the decision of leaving after this year’s mishap. At the 2014 World Cup in Brazil, the USSF collected a total of $10.5 million — $1.5 million for participating and $9 million for advancing to the round of 16. Playing in a World Cup also attracts sponsors, and although the U.S. team has already locked down many of them, its absence at next year’s World Cup will definitely make it harder to forge new sponsorship relationships in the future. David Carter, executive director of the Marshall Sports Business Institute at the University of Southern California, commented on the topic of sponsorships. The current status of the U.S. soccer team has larger consequences than just missing this one World Cup, however. The U.S. team’s next World Cup game will take place during Thanksgiving week more than five years from now. And that’s the best case scenario. Teenage wunderkind Christian Pulisic will be 24, several years into his career. Tim Howard, whose last World Cup was without a doubt a legendary performance, will likely leave U.S. soccer with the lasting image of one of his worst performances. And never again will Clint Dempsey and captain Michael Bradley step on soccer’s biggest stage. Furthermore, the subpar performance of the U.S. soccer team has highlighted and brought to attention several other issues with the U.S. soccer landscape, especially for youth players. Under criticism now is the subtle pay-to-play culture that’s made soccer a sport played primarily by upper-middle class white kids. Doug Anderson, the chairman of U.S. Soccer’s diversity task force saw a broken system in America. He saw well-to-do families spending thousands of dollars each year on club soccer for their children, while thousands of gifted players in mostly African American and Latino neighborhoods get left behind. “People don’t want to talk about it., The system is not working for the underserved community. It’s working for white kids,” said Anderson. Some believe that the struggles of the U.S. team can be attributed to the lack in the ability of certain demographics to afford the high prices of the elite soccer clubs that send kids to the national team. One former U.S. soccer official shares this opinion about the future of the country’s soccer team. “How good would we be if we could just get the kids in the cities?” he questions. The failure of the U.S. men’s national team to qualify for the World Cup this year was already a disappointing outcome for American sports. Now, with further issues concerning race and socioeconomic backgrounds, we are sure to hear more negative news about United States soccer, both professional and youth, in the near future.